Summer has already been packed with many colourful and exciting projects, with June taking us from the Southbank, to Cambridge and Epping Forest for Le Tour De France. We are delighted to announce that we have been awarded National Portfolio Funding from the Arts Council of England from 2015-18. We are hugely excited to be pushing forward in the South East region with additional support to launch innovative projects embracing this vastly changing landscape where we can train emerging artists, leave a legacy, and be part of a wider arts community that is leading on change through the Creative Industries. 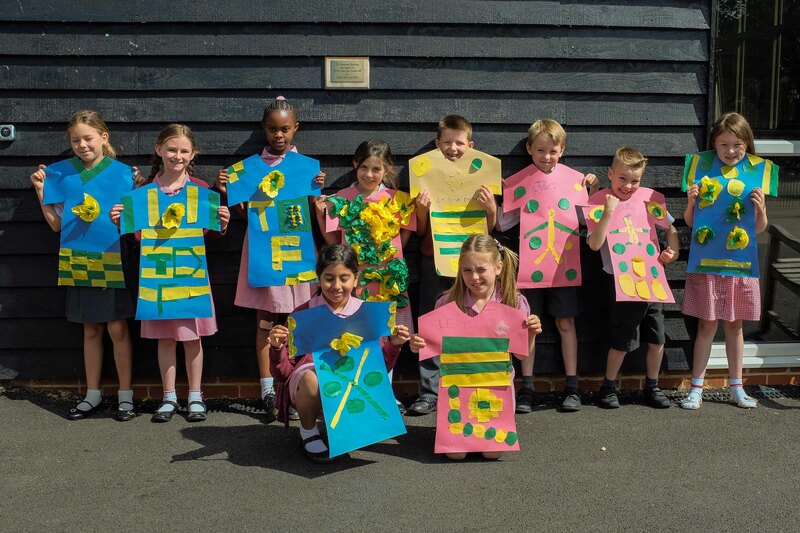 Pupils of Lambourne Primary with their flag designs for Le Tour de France. Kinetika has its NPO status renewed until 2018. Kinetika were featured in the Southend Standard and Echo News (Essex) as one of a host of arts organisations with successful applications in the South East.For more information on what it means to be an NPO you can read more on the Arts Council’s website here. Kinetika is hosting a Studio Warming event on 17th July 11.30am – 2.30pm inviting local artists, organisations and education leaders to meet us and find out more about the work we do and what we hope to do in future. 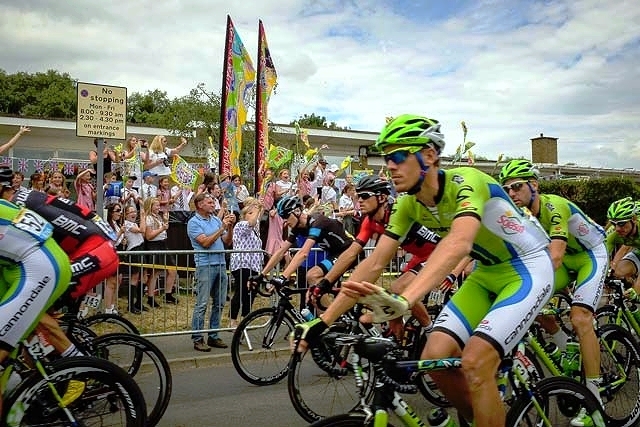 From quirkiness in Cambridge to esteem building in Epping – Kinetika’s Le Tour De France 2014 projects get people moving! Having just moved into fresh new studios at High House Production Park in April, Kinetika instantly began preparing for two projects for Le Tour De France 2014, in Cambridge and Epping Forest. Ali Pretty, who led the inset days and design, also helped create four large flags for each school. It might have passed in a flash of wheels and helicopters, but the flags will create lasting memories for all those involved in making the “grandest Grand Depart” of the race’s 111-year history (according to the race director, Christian Prudhomme via the BBC). To see the designs created and learn more about Kinetika’s project, see the TDF Galleries here and our project page, which will soon be updated with lots more images of the big day. Photos by Mike Johnston. Moreton Primary school children proudly hold their flags and TDF celebration creations as the race passes right past their school. 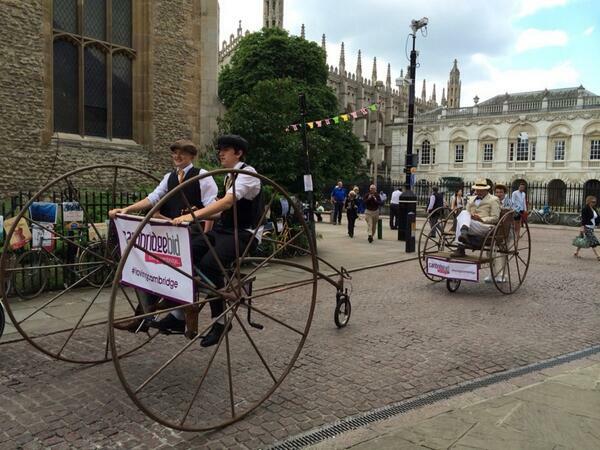 Continuing the celebrations of Le Tour, as well as the history of cycling in Cambridge, Kinetika pleasedto be invited by the Cambridge Bid to bring some of its marvellous moving structures to celebrate the VELO Festival 2014. 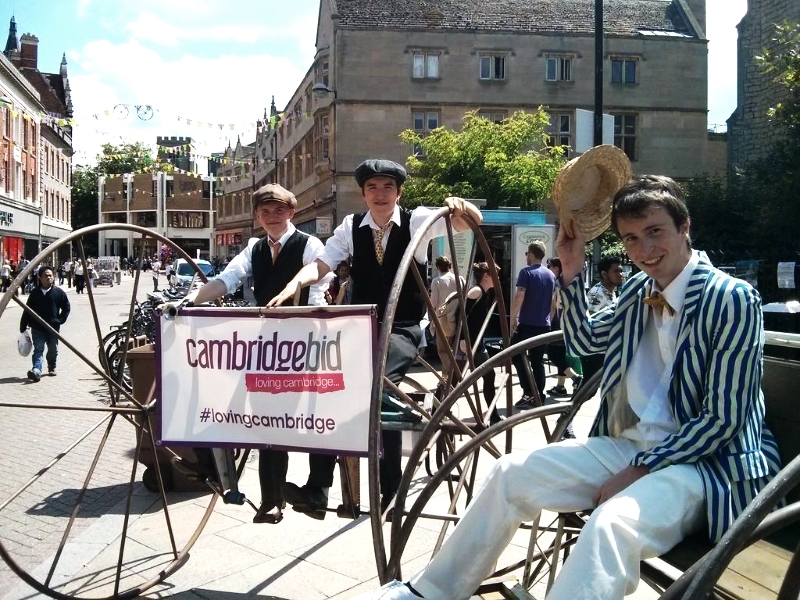 Made by Mike Pattison two years ago for the Paralympic Games closing ceremony event, the fantastic Dicycle and Quadricycle scooped much attention on the streets on Cambridge on 1 July, and in case you missed them, they will return for more antics on the 10th and 12th July. Kinetika brings colour to the Southbank as part of the Festival of Love! Commissioned by the Southbank Centre, Kinetika created ten ‘Tanabata’ Lanterns for the very colourful ‘Festival of Love’ which runs from Saturday 28 June 2014 – Sunday 31 August 2014. Working with The Japan Society London, Kinetika artists Iola Weir, Mark Forrest, Sarah Jo Evans, Elisabetta Massimi and Tony Mason made the striking hanging structures, which were then embellished with decorations made by members of the general public at free workshops in June. The lanterns now hang in pride of place for all to see on the face of the Royal Festival Hall! Ali will be working with Leicester based participants to live paint a 40m piece of silk during the festival on Humberstone Gate at 11am Sunday 17th August. As with all performances, visual art and moving image at the event, Silkscape will respond to theme of ‘celebrating freedom & democracy through artistic innovation’. To find out more about the project and to link through to the festival click here. Ali Pretty has been commissioned by Art Reach to create silk banners as site decor for this year’s Art In The Park Festival, a free family event which showcases the best of Islamic and Islamic-inspired artwork. To find out more click here.